Developer Revolution Software Alt Title B.A.S.S. Comment One of the best and most interresting graphic adventures ever. Robert Foster is a young man, trapped in a dark futuristic city built on the height, hunted by federal agents and wanted for a crime he didn't commit. Just recently he was living a peaceful life outside the polluted megacity, together with a group of friendly outcasts not wanted inside the city. They were all happy as it was, until one day, when a federal helicopter full of agents suddenly comes to arrest him. He is brought back inside the city along with his robotic friend, Joey, when something goes wrong and the helicopter crashes into the ground. Robert manages to escape inside a factory, but the agents are already after him. It is all up to you now, as you must help him escape the city and to find out about his past. The graphical part of B.A.S.S. is a true beauty in the eyes. Handpainted, atmospheric backdrops with futuristic themes remind a little of the 1982 movie 'Blade Runner' and looks totally awesome on the computer screen. The floppy version of B.A.S.S. almost had no ingame sound at all, except for a few sound effects here and there. 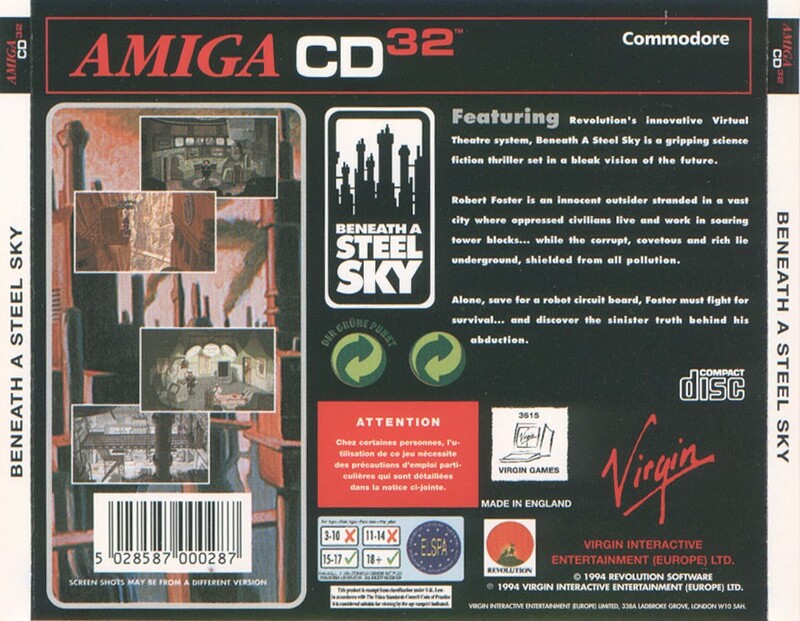 The CD32 version features GREAT ingame music throughout the whole game, and full speech for all characters. The speech is ofcourse very cool, although I find it a little annoying at some stages (all characters speak with scottish accent and doesn't really fit the game as a whole that good...). Still a very cool feature though! B.A.S.S. is truely one of the best games of this genre. It has a really interresting plot, involving lots of surprises and many dark secrets. The game is ofcourse filled with a lot of humour and jokes too, mostly delivered by your moody robotic follower Joey, who doesn't seem to be able to speak a word without being sarcastic in some way or another. The game is developed by Revolution Software, and this is their second title if I remember correctly. They had released Lure of the Temptress a few years earlier, which in many ways are similiar to B.A.S.S. They would later on release the popular PC titles Broken Sword and Broken Sword 2, and appearently there is a third part in the Broken Sword series on the way.